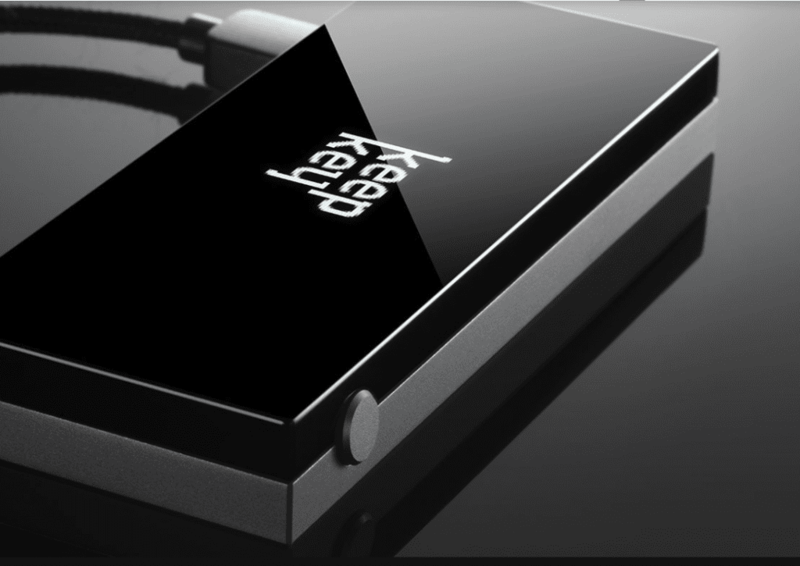 KeepKey Wallet is one of the oldest (launched in the year 2015) and secure Bitcoin hardware wallets to secure the cryptocurrency coins and tokens. It uses advanced technology to protect the customer’s funds from theft or hacks. It is a multicurrency wallet which can hold all the popular cryptocurrencies like Bitcoin, Litecoin, Ethereum, Bitcoin Gold, Dash, Dogecoin and more. As KeepKey has been integrated with the ShapeShift cryptocurrency exchange, it is possible to exchange the digital assets directly from the device. 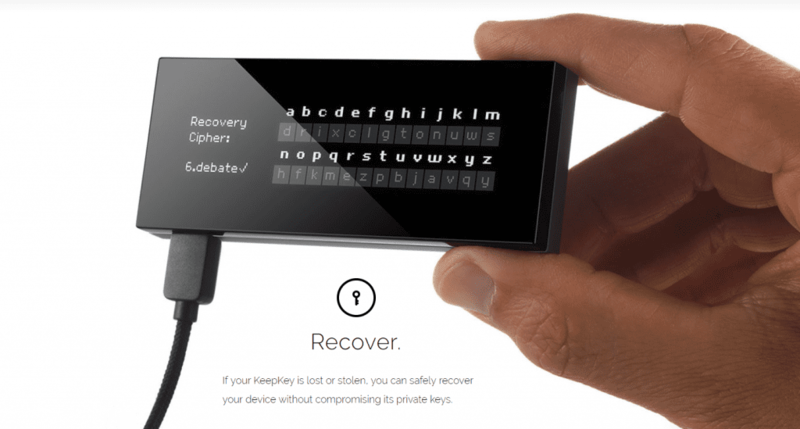 KeepKey wallet also provides the option to recover your account in case the device is broken, stolen or lost. This hardware wallet comes with a big screen which is used to display information about all your transactions. Unlike the Trezor and Ledger Nano S, KeepKey has only one button which is used to control the entire operation of the device. The Wallet doesn’t require any battery for its operation. The prize of the KeepKey was close to $200 when it was first launched. Recently, there was a huge drop in the price and is now available for less than $100 to compete with other hardware wallets. It is recommended users can purchase the wallet directly from the official website here. To know the full list of coins and tokens supported by KeepKey wallet, simply check out their site and click on the ‘CRYPTOASSETS’ tab to browse through the full list. KeepKey can be connected to the computer via a USB port. The operating system compatible with the device is Windows, Mac, and Linux. It is possible to use the KeepKey device with your mobile phone by installing the MyCelium app which is available on both Google Play Store and App Store. The device must be connected to your phone using an OTG adapter cable. If there is no option on your mobile phone to connect the OTG cable, then you cannot use KeepKey on your phone. Like Trezor, the KeepKey wallet is protected with a holographic seal so that it is not tampered by anyone. The user must ensure that the seal is not broken and intact. Otherwise, the user should contact the customer support immediately. To initialize the KeepKey wallet, the user must have the latest version of Google Chrome on his computer. 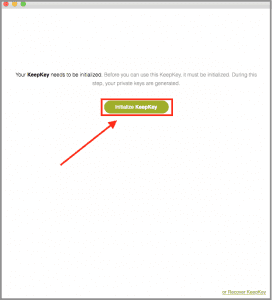 Next, the KeepKey app needs to be installed after downloading it from the Chrome App Store. Click here for further information. Connect the KeeyKey wallet to the computer using the USB cable. 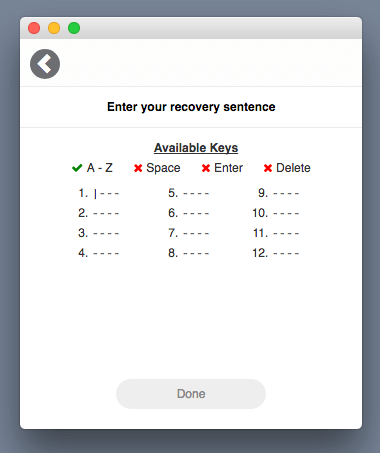 Then, you must make a note of the recovery seed which is 12-words long. It will be displayed only on the KeepKey device. Note down every word carefully and write down them on the recovery card that came along with the device. (Do not store your recovery seed on your computer, mobile phone, online storage drive or any place which is easily accessible). Once you had noted down all the words, press the button on the device to complete the initialization of KeepKey wallet. To send/receive digital assets using the KeepKey wallet, the user must create an account by following the steps listed below. 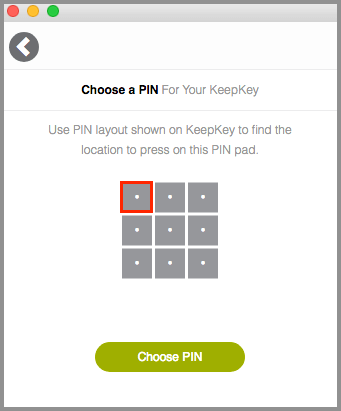 Connect the KeepKey to your computer, open the KeepKey client app and enter the PIN. Click the Add account button (+) on the bottom right of your screen. 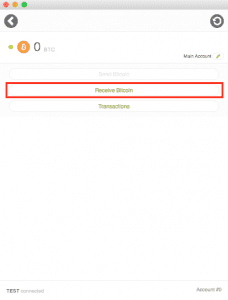 Select the cryptocurrency from the drop-down menu to create the account. 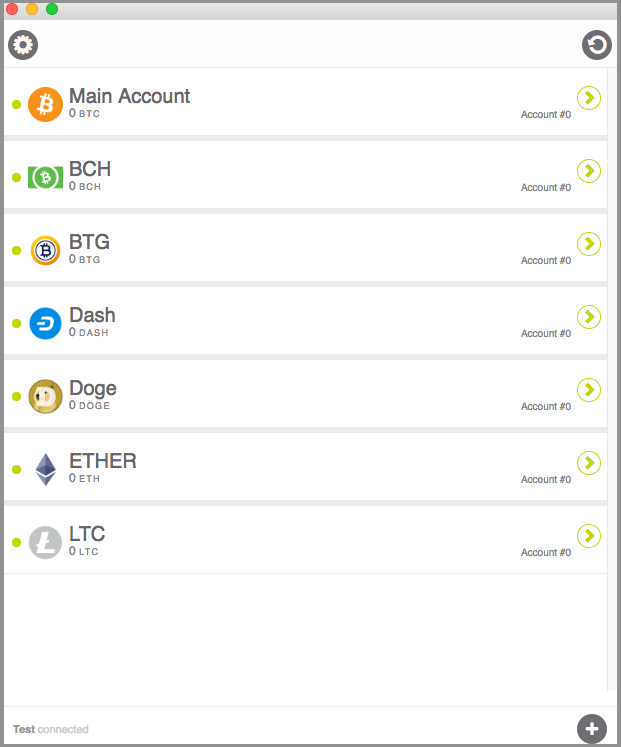 Currently, KeepKey supports BTC, ETH, LTC, DASH, DOGE and BCH. All the ERC20 tokens will be created as sub-accounts under ETH. Then, enter the name for your account (eg. MyBTC) and click Add Account. Even though you can create an unlimited number of accounts, KeepKey highly recommends the users to keep a maximum of 10 accounts for faster operation of the device. 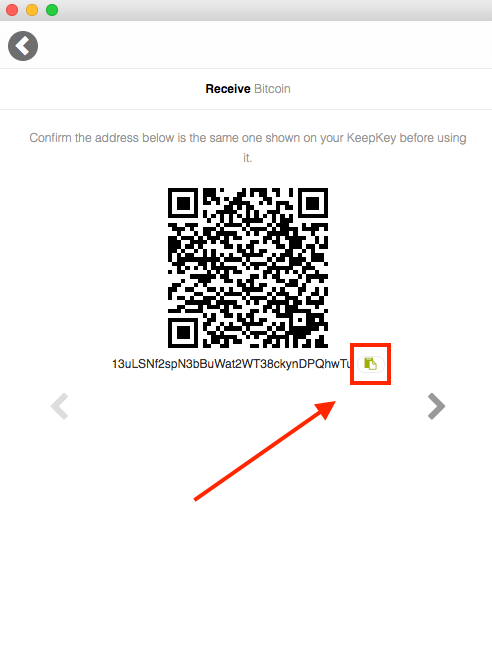 Follow the below steps to receive BTC, Altcoins or any ERC20 token on your KeepKey wallet. Connect the KeepKey to your computer, open the KeepKey client app and enter the PIN to authenticate your device. Then, you will see the receiving address displayed on the screen. You must ensure that the address displayed on the screen and the KeepKey device are the same. Once the sender makes the transaction, you will receive the funds on your KeepKey wallet. For better privacy, it is highly recommended to use a unique address for every transaction. By default, the KeepKey will generate a new address for every transaction. Select the button titled Send/Trade. Then, enter the destination address to which you would like to send the coins. 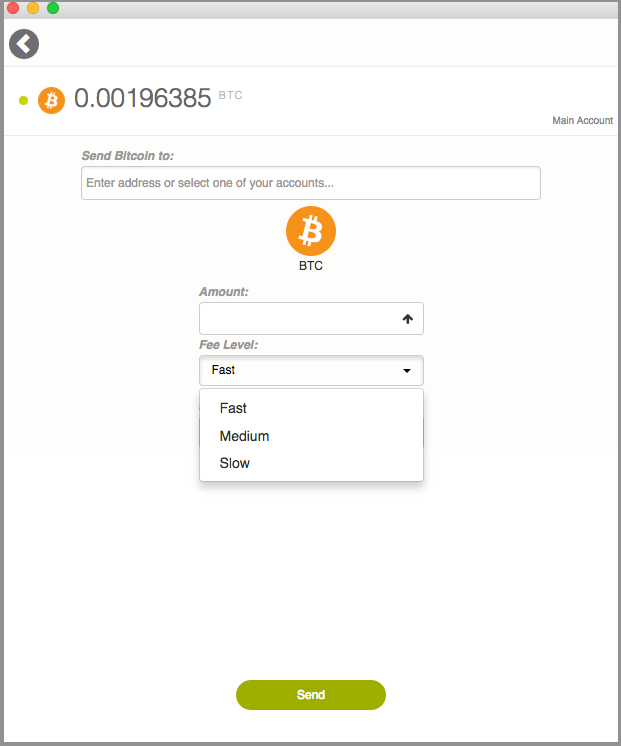 Enter the amount of cryptocurrency you would like to send and choose the level of the transaction (Fast/Medium/Slow). Faster transactions require high transaction fees whereas slower transactions require only little fees but take more time to complete the transaction. Then, click the Send button. Enter your PIN. Double check the amount displayed in the screen and the KeepKey device are the same. 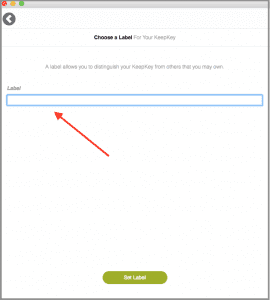 If yes, then click the button on the KeepKey device to authorize the transaction. Congratulations! You have successfully moved your funds out of the KeepKey wallet. To know the status of your transaction, you can check the Transaction History on your KeepKey client app. Since KeepKey is integrated with the ShapeShift exchange, it is possible to exchange the digital assets directly from the wallet. Make sure have signed up as Shapeshift Member If you don’t, it will not work. This is mostly due Shapeshift following KYC procedures. To do so, go to you KeepKey Settings > Log in To ShapeShift > Click ‘SignUP’. Connect the KeepKey to your computer and open the KeepKey client app. Select the account from which you would like to use the digital assets for trading. Click the button titled Send/Trade. On the destination address field, select the cryptocurrency you wish to exchange. Then, enter the amount of the cryptocurrency and click the Trade button located at the bottom of the screen. Next, you must authenticate the transaction by entering the PIN. Then, you must ensure that the information shown on the screen and device are the same. If yes, press the button on the KeepKey to confirm the transaction. That’s it. Now, ShapeShift exchange will take care of the transaction. KeepKey is an HD (Hierarchical Deterministic) wallet which uses the BIP32 protocol to store the private keys of Bitcoin, Altcoins and other ERC20 tokens. As it uses BIP32, it is possible to generate and store an unlimited number of private keys on the KeepKey wallet. While entering the PIN code, the numbers will be shown only on the KeepKey device and not on the computer to prevent hacking using keyloggers or other kinds of mechanisms. Therefore, it is extremely safe to store the cryptocurrencies in the KeepKey wallet. In addition to the PIN, the users can also set an optional passphrase for extra protection. As the microcontroller in the KeepKey has read protection, it is impossible to access the flash memory where the private keys are stored. Even if the hacker steals the device and tries to use any debugger tool to communicate with the device, it is impossible to read the private keys from the device. Because of the KeepKey’s advanced technology, it is completely safe to use the wallet even on untrusted, unknown or infected computers as the private key is stored securely and won’t be revealed outside the device. 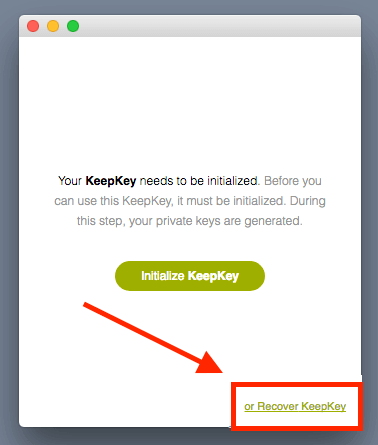 To recover your account into another KeepKey device, follow the below steps. Connect the new KeepKey device to your computer, open the KeepKey client app. Congratulations! Your account has been recovered successfully and the account information will be displayed on the screen. Even if you don’t have another KeepKey device, it is still possible to recover your accounts on any wallet that is compatible with the BIP44 protocol like MyCelium, Coinomi, CoPay, Exodus etc. On the other hand, if you have to recover only one account, then it can be done using any BIP39 compatible wallet. 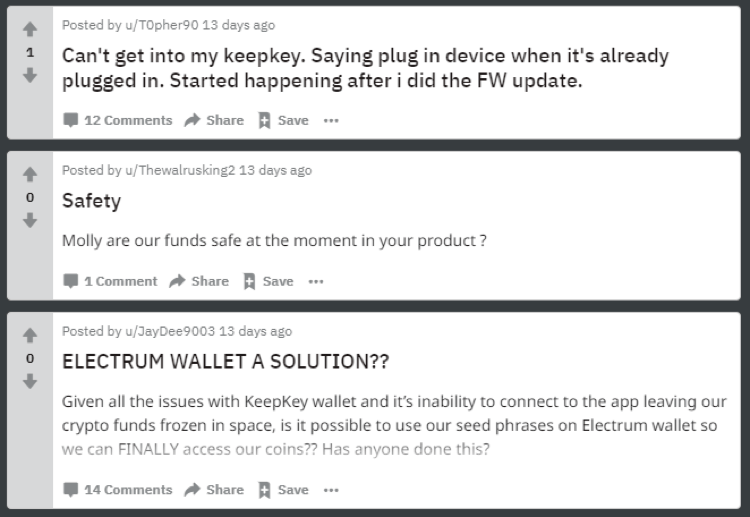 Even though KeepKey has recently reduced its price, it is not as popular like the other two hardware wallets Trezor and Ledger Nano S. Many users have reported connectivity issues on the Reddit forum. As well as reporting that their customer support team is relatively slow to resolve these issues. Other than connectivity, no issues related to security have been reported on the social media or forums like Reddit. Overall, KeepKey is considered a safe hardware wallet to store coins and tokens. KeepKey Wallet has only one button to control the entire operation of the device whereas Trezor supports touchscreen as well as physical buttons. The display screen of KeepKey is slightly bigger than Trezor One and Trezor Model T. Like Trezor, KeepKey also supports the Blind matrix to improve the security of the PIN Code entry. Both the devices are easy to configure and offer extreme security to the customer’s funds. Trezor supports a larger number of coins and tokens than KeepKey. Regarding the price, both Trezor and KeepKey Wallets are sold at almost the same price. KeepKey has only one button whereas Ledger Nano S comes with two buttons. As the display of KeepKey Wallet is bigger in size, it cannot be carried easily by keeping in a pocket like the Ledger Nano S. Both the wallets provide extreme security to the customer’s funds. Regarding the cryptocurrencies, Ledger Nano S supports more coins than KeepKey. Even though both wallets provide similar features like recovery option, multi-coin support etc, KeepKey is a bit costly than Ledger Nano S.
Trusted by both novice and professional traders to secure their digital assets, Ledger Nano S is the most popular and secure hardware wallet. Exodus is a desktop client or software wallet that gives users accessibility to not only to store but even exchange blockchain-based assets, since it has a built in exchange.